Many disasters and emergencies don’t make news headlines, but the needs are no less real and the impacts on families are equally devastating. Called to respond to suffering caused by natural disasters, long-term conflict and other emergencies, PWS&D reaches out to the most vulnerable to address immediate needs such as food, water and sanitation, and shelter, as well as long-term needs including livelihood recovery, education assistance and psychosocial support. Through Canadian Foodgrains Bank, PWS&D accesses food assistance funding through matching grants from the Canadian government and collaborations with other members of the Foodgrains Bank. 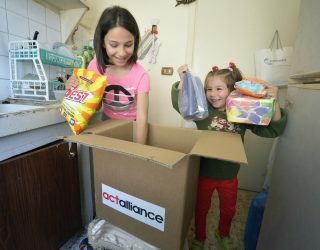 Through other members of the ACT Alliance, PWS&D can respond to disasters virtually anywhere in the world, providing core relief items to help communities recover and rebuild. Past responses with other denominations under Canadian Churches in Action has allowed PWS&D to secure government funding for non-food responses to disasters. These relationships increase our impact and allow us to act quickly—maximizing Presbyterian support to benefit more people in need. Having fled violence and persecution in Myanmar, Rohingya refugees in Bangladesh are receiving food aid and other relief items to improve living conditions in makeshift camps. Responding to devastation caused by a brutal civil war, food aid as well as livelihoods, education, shelter, and water and sanitation support is meeting the needs of vulnerable populations in Jordan, Lebanon and Syria. In response to the conflict-induced food crisis, this project ensures food, nutrition and livelihood recovery for affected populations. Emergency rations and nutrition assistance are helping families meet their food needs in the wake of severe drought caused by a powerful El Niño event. Families escaping armed conflict are receiving food, seeds and tools to improve their food security. Vulnerable Palestinians are receiving assistance to reduce their suffering and improve livelihoods during the ongoing siege imposed on the Gaza Strip. In response to the ISIL-induced humanitarian crisis, distributions of emergency relief are providing some comfort for those displaced by conflict. Thanks to your faithful and generous support, families are receiving food assistance in times of hunger and people are being supporting when disaster and conflict strike. Make a donation today to help alleviate the suffering of people in crisis.